Announcement Now offering free shipping within the US on all appliques! Want to throw a great baby shower with a unique activity? My iron on fabric appliques make beautiful outfits for baby and are the perfect activity for both crafty and non-crafty guests. As of 2017 I am no longer selling baby bodysuits, but I am happy to give you tips about where to purchase if you send me a convo. I absolutely love crafting for babies and children, and I also love making personalized, fully customized items. Maybe you are having a nautical themed baby shower or want an outfit for your geeky friend's new baby. I'm happy to make you the perfect item! Be sure to follow me on Facebook at facebook.com/bingecrafter for special deals, giveaways, and notification of new products and read my blog on bingecrafter.com. You can also find me on Instagram at @binge_crafter. Although all fabrics have been prewashed, I recommend washing with a color catcher for the first wash. Wash with cold water. Dry with little or no heat (or hang dry). Avoid excessive ironing over appliqué. Now offering free shipping within the US on all appliques! Very happy with appliqués. Very fast at getting back to you if you have any questions. Woodland animal set for a baby girl. I can make these in many different color schemes. Cute letter A’s headed to a customer! I love custom orders. Custom orders are my favorites! This sweet woodland set in navy, forest green, mint, and grey is headed to a customer today. What can I make for you? The iron on appliques I make are so easy to use! Peel, iron, and done! No sewing needed. 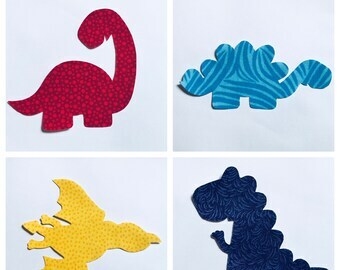 Customers often use my appliques for baby shower craft decorating stations. All of my items can be customized for you! I started the Binge Crafter blog in 2009 when I was pregnant with my first daughter. I was a teacher prior to staying home with my kids and crafting quickly became my hobby of choice. I loved being able to make my daughters cute things like the ones I found in boutiques for a fraction of the cost. My husband came up with the name Binge Crafter because I was constantly finding something new I wanted to try to make. In 2012 I decided to open an Etsy shop to sell some of these creations. Most of the things I sell are things I've made for my own daughters, nephews and nieces, and friends. I love sharing my creations with others and Etsy has been an amazing way to do that. While I love crafting a variety of things, most of the items I currently offer on Etsy are iron on appliques for baby shower decorating stations. However, if you see one of my other crafts on my blog or social media and would like me to recreate it for you, please ask! I love doing custom work. Printful is a print on demand manufacturer who takes Binge Crafter original designs and prints them on mugs, tees, and more. You will receive your order directly from their processing facility to ensure timely processing. Thank you so much for visiting Binge Crafter! I create unique and affordable gifts for babies, parties, and other occasions. All items are customizable to provide you with the perfect item to match your style and taste. I hope to make your purchasing experience as pleasant as possible. Custom items cannot be returned or refunded. I am happy to send you pictures of items in progress to ensure they are made according to your specifications. Please contact me for more information. Returns or refunds will not be made on digital files. Payments can be made through Paypal or Etsy. Items will be shipped after payment is received. Custom items will be made after payment is received. Currently I am shipping within the United States via USPS. Some items are able to ship internationally. I would love to make a custom item for you! Please contact me with your request and for additional information. Items can also be purchased in bulk for a discounted price.